For thousands of years, Native Americans have lived and thrived in the area surrounding Jeffers. The petroglyphs found at Jeffers represent both the Native American history of the region and the spiritual significance of the landscape. The petroglyphs are significant, documenting Native American presence, historic events, and spiritual beliefs on the sacred landscape. 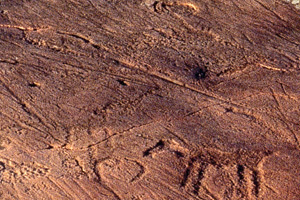 The petroglyphs have been continually used by Native Americans for the last several thousand years. We know from oral histories, historical records, and archaeology, that the area was inhabited and visited by several tribal nations. The southwest region of Minnesota was often shared by several tribes recognizing the sacredness of the area. The Ioway, Otoe, Cheyenne, and the Dakota are a few nations who respected the region and consider it home and important to their tribal histories. For thousands of years, Native Americans have hunted buffalo and other game, picked and planted plants and crops, and fished and navigated among the many rivers and lakes. Native Americans preferred to live in hide-covered houses when following the herds of buffalo for easy mobility, and in sturdy bark-and-post structures in more permanent village sites. Conflict and the United States westward expansion displaced many of the regions original inhabitants. Today, the Dakota geographically represent the closest tribal communities to the site, and continue to live on tribal lands in Minnesota, North Dakota, South Dakota, Nebraska, Montana and Canada. They, along with the loway, Cheyenne, and Ojibwe, are helping the Minnesota Historical Society and its visitors understand this sacred place. In the mid-19th century, European and American settlers arrived, and their farming altered the landscape. Along the northern border of the site is a wagon trail created in the first years of settlement. The settlers plowed the prairies, and introduced exotic plants from Europe, Asia and Africa. The native prairie that surrounds the rock face survived because the soil was too shallow to plow. On the horizon you see the fields, houses, barns, and grain silos of contemporary farmers. In the 1960s, local residents recognized the cultural and environmental value of the site. They cleared it of fieldstones and refuse, identified and recorded the carvings and plant life, and urged the Minnesota Historical Society to acquire the site. In 1966, the Society purchased the site with the hope of providing knowledge of, and appreciation for, the history of the rock carvings, the environment in which they are found, and the people who made them. Rock carvings are among the most enduring forms of human expression. Minnesota’s recorded history begins at this site, where Native Americans have been coming for thousands of years to worship and record the story of their lives. Native Americans, including the Dakota and Lakota, Ioway, Cheyanne, and Ojibwe, hold this place sacred and continue to conduct religious prayers and ceremonies here as their ancestors did thousands of years ago. Please respect this place in the same manner that you respect your own place of worship.